Kongka La is the low ridge pass in the Himalayas. It is in the disputed India-China border area in Ladakh. In the map the red zone is the disputed area still under Chinese control in the Aksai Chin area. The Chinese held northeastern part is known as Aksai Chin and Indian South West is known as Ladakh. This was where Indian and Chinese army fought major war in 1962. The area is one of the least accessed area in the world and by agreement the two countries do not patrol that part of the border. According to many tourists, Buddhist monks and the local people of Ladakh, Indian Army and Chinese Military maintain the line of control. But there is something much more serious happening in this area. According to the few locals people on the Indian and Chinese side, this is where the UFOs are seen coming out of the ground. 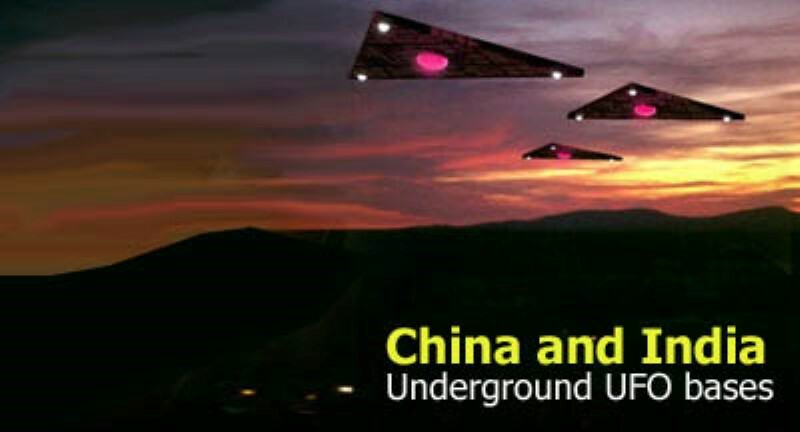 According to many, the UFO underground bases are in this region and both the Indian and Chinese Government know this very well. Recently, some Hindu pilgrims on their way to Mount Kailash from the Western pass, came across strange lights in the sky. The local guides while in the Chinese territory told them that this was nothing new and is a normal phenomenon from Kongka Pass area the tensed border between India and China. This strange lighted triangular silent crafts show up from underground and moves almost vertically up. Some of the adventurous pilgrims wanted to look into the site. They were first turned by the Chinese guard posts as they were refused entry from the Chinese side and then when they tried to approach the site from Indian side, the Indian border patrol also turned them down in spite of their permit to travel between the two countries. The pilgrims at that stage started quizzing the Indian border petrol personnel. According to them, the security personnel told them that they are ordered not to allow any one near the area of interest and it is true that strange objects come out from under the ground with amplified and modulated lights. India’s Special Forces and possible visit the area by intelligence agencies. The locals start laughing in that area when they are asked about these UFO sightings. According to them the extra-terrestrial presence is well known and is in deep into the ground. They believe neither the Indian or Chinese Governments want to expose the fact for some reason. When they bring up thus matter to local Governments, they are told to keep quiet. This is the region where the Euresian plate and the Indian plate have created convergent plate boundaries. Convergent plate boundaries are formed where one plate dives under another. Thus this is one of the very few areas in the world where the depth of the crust twice as much as in other places. The opposite is found in hot spots like Yellow Stone National Park in America where the earth’s crust in thin. The double thick earth crust allows the creation of underground bases deep into the tectonic plates. Kongka La has beautiful rocks and granites. For some strange reasons neither Chinese nor Indian authorities ever excavate, dig or mine holes in this area. The area is pristine and untouched. Recently, both India and China have moved forward to solve all border disputes and start the Sino-Indian relations all over again. The Aksai Chin area is still disputed. But interesting while negotiations both the Governments are indifferent on this area. India and China as shown in the accompanying maps have huge border along the Himalayas and they are negotiating on all these regions. Though India claims that Aksai Chin is part of India, the common belief in the Government, it is not a show stopper. On the other hand, Chinese after winning Aksai Chin from India in 1962 war, built a strategic military highway. Now they are using an alternate highway no to bother with the area in Kongka La. Recently in the local school, young children of the area entered into a drawing contest. More than half of the drawings had to do with strange objects in the sky and some coming out of the mountains. Many of them even know what and when to look for. Many UFO researchers believe that there are hidden UFO bases under the ocean and deep under the ground. Kongka La is experiencing some strange phenomenon and suspicious objects coming out of the inaccessible huge mountains (Himalayas) and both the Governments refuse to come out and say what these are. The other alternative is that it is an underground strategic Air Force base of some one. Then why will either country allow the base on the official no man’s land in the highly sensitive disputed border areas? Why is this region continuously reporting UFO sightings from various kinds of people? Is it possible that aliens landed in China a long time ago following their spaceship’s crash, and settled there? Scientists and archaeologists studied tombs, remains, strange objects, ethnologists spoke to their descent, a linguist translated their writings, but… as incredible as it sounds, no recent investigation has been made since. The story just served as a plot for an X-Files episode. One of the strangest stories dealing with ancient visitors began in 1938 when archaeologist Chi Pu Tei discovered regularly aligned rows of graves in the Baian Kara Ula mountains near the Sino-Tibetan border. Beneath cave drawings of beings wearing helmets along with depictions of the stars, sun and moon, small frail skeletons with unusually large skulls were found. Chi Pu Tei theorized that the skeletons belonged to an extinct species of mountain ape and that the drawings were left in the caves by human tribes. Since the graves were in systematic rows, his theory was laughed at and forgotten until 1962, when stone plates found among the graves were translated by Professor Tsum Um Nui of the Academy of Prehistoric Research in Beijing. Shortly after World War II, a Polish professor named Lolladoff showed one of the ‘stone disks’ to British scientist Dr. Karyl Robin-Evans, who helped bring the story to the western world. Lolladoff claimed to have bought the disk in Mussorie in Northern India and that it was supposed to be from a mysterious people called the “Dzopa” (or “Dropa”) who had used it for religious rituals. Robin-Evans would follow the trail of the Dropa to its origins, and was able to take a rare photograph of the Dropa leaders in 1947. His visit with the Dalai Lama was legendary, and provided a wealth of information on the reclusive, unique tribe of people. The translation told an eerie story of a group of beings that crash-landed on the third planet of this star system about twelve thousand years ago. Unable to repair their craft, this group attempted to make friends with the mountain tribes but were hunted down and killed due to their non-human features. Since this account was not compatible with the Western world-view, it too was dismissed. In 1938 high in the mountains of BayanKara-Ula, on the borders of China and Tibet a team of archaeologists were conducting a very detailed routine survey of a series of interlocking caves. Their interests had been excited by the discovery of lines of neatly arranged graves which contained the skeletons of what must have been a race of human beings. They appeared to have spindly bodies and large overdeveloped heads. At first it had been thought that the caves had been the home of a hitherto unknown species of ape. But as the species seemed to bury its dead they eliminated an ape race. While studying the skeletons one of the members of the team stumbled on a large round stone disc half buried in the dust on the floor of the cave. The disc looked like an Stone Age record. There was a hole in the center of and a fine spiral groove that is a continuous spiraling line of closely written characters. No one understood the meanings of the message. The disc was labeled and filed away among other finds in the area. For 20 years many experts in Peking tried to translate the disc. Finally Dr. Tsum Um Nui broke the code and started to decipher the “speaking grooves”. The Peking academy of Pre-History forbade him to publish his findings. In 1965, 716 more grooved stone discs were uncovered in the same caves. They told the story of a “space probe” by the inhabitants of another planet who came to the Baya-Kara-Ula mountain range. They had crash landed. Their peaceful intentions had been misinterpreted. Many of them had been hunted down and killed by members of the Han tribe, who lived in the neighboring caves. They referred to themselves as the Dropas. They said they came down from the clouds in their space craft. It crashed landed in remote and inaccessible mountains. There was no way to build a new ship. Legend in the area spoke of small gaunt yellow faced men who came from the clouds long ago. The men had huge bulging heads and puny bodies. They were so ugly they were hunted down and killed. This description is similar to the bodies found in the caves. On the walls of the caves archaeologists found crude pictures of the rising Sun, the Moon, unidentifiable stars and the earth all joined together by lines of pea-sized dots. The cave drawings have been dated around 12,000 years ago. The cave area is still inhabited by 2 semi-troglodyte tribes known as the Hans and the Dropas. These tribes are odd looking in appearance. They are frail and stunted in growth averaging only about 5 feet in height. They are neither typically Chinese nor Tibetan. In Russia several of the rock were tested. The discs were found to contain large amounts of cobalt and other metallic substances. When placed on a special turntable they vibrated or hummed in an unusual rhythm as thought an electric charge was passing through them. It is as if they formed some part of an electrical circuit.